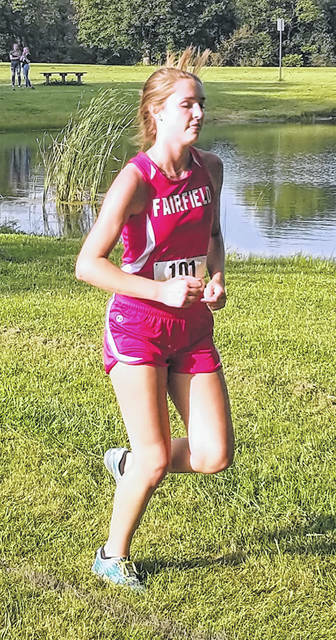 In this Times-Gazette file photo Fairfield’s Morgan Richmond runs past the pond at Mitchell Park in Greenfield where Fairfield took part in the McClain Invitational on August 22. Hillsboro’s boys and girls Cross Country teams hosted the 2018 Ohio Classic Cross Country Extravaganza on Saturday at Liberty Park in Hillsboro. Teams from Adams, Brown, Clinton, Fayette and Highland counties attended the meet and Highland County’s own teams from Fairfield High School took first place in the boys and girls races. For the boys Fairfield finished with a total of 25 points as a team with all five of their top runners finishing in the top 10. Miami Trace was second with 61 points, in third place was Western Brown with 91 points, fourth went to Eastern who finished with 95 points, Adena was fifth and finished with 144 points, McClain took sixth with 162 points, East Clinton was seventh and had a total of 174 points and Hillsboro came in eighth with 195 points as a team. In the girls race Fairfield narrowly beat out Eastern as they finished first and second with scores of 48 and 50 points respectively. Western Brown was third with a score of 91, Hillsboro claimed fourth with 110 team points, Miami Trace was fifth and scored 120 points, East Clinton placed sixth with a score of 140 and Adena was seventh with 151 team points. Following are the individual results for the boys and girls races.